That didn’t happen. So on Oct. 13, self-declared “Citizens’ Prosecutor” Larry Klayman, who convened the so-called grand jury, appeared on the steps of Washington, D.C.’s World War II Memorial and called on a cheering crowd to “wage a second American nonviolent revolution, to use civil disobedience, and to demand that this president leave town … to put the Koran down and … come out with his hands up.” The date he set for Obama’s “last chance” was Nov. 19. To accomplish that lofty goal, Klayman formed the “Reclaim America Now Coalition.” Its members include Jihad Watch, an anti-Muslim hate group whose director, Robert Spencer, believes that Islam is an inherently violent religion and that multiculturalism is an anti-Christian conspiracy to destroy the West; You Can Run But You Cannot Hide International, an anti-gay “ministry” and hate group whose leader, Bradlee Dean, has argued that it is moral to execute LGBT people; Ride for the Constitution, a coterie of truckers who made news in October with plans to jam Washington, D.C., roads until their demands, which included the president’s impeachment, were met; Gun Owners of America, a pro-militia group that has been described as “eight lanes to the right of the NRA”; and a raft of other extremist organizations united by their loathing of America’s 44th president. Although he launched a number of lawsuits and other campaigns between 2000 and 2008, Klayman made little news during the Bush years. But the election of Barack Obama – who Klayman believes to be a crypto-Muslim, proto-communist pretender to the presidency – seems to have driven him over the edge. Klayman hasn’t attempted a “citizen’s arrest” of President Obama or any of the other top-level officials he’s “indicted” but he has shown a willingness to engage in rhetoric and stunts that straddle the border between funny and unnerving. Visitors to CitizensGrandJury.com, the website on which he announces the Ocala-based group’s various activities, are greeted with a rousing chorus of “Do You Hear the People Sing?” the revolutionary anthem from “Les Miserables.” And while claiming to be calling for peaceful revolution, Klayman has no problem with violent imagery. Klayman wasn’t always such a fringe figure. He began his professional career in Washington as a prosecutor with the U.S. Department of Justice’s (DOJ) consumer affairs division. There, he wrote in Whores, he learned that “rather than being a friend of the people, the government was often their enemy.” After a stint at a private law firm whose “partners also proved to be weak and ethically compromised,” he quit and opened his own practice, where he formulated the strategy that would make him famous. Klayman, who seems to perceive every setback or sign of opposition as a personal attack, sees “there” everywhere. Like many in the antigovernment “Patriot” community, for which he clearly has an affinity, he believes the 1995 bombing of Oklahoma City’s Alfred P. Murrah Federal Building by domestic terrorists was actually masterminded by Saddam Hussein and “American neo-Nazis.” Also like many in the Patriot movement, he believes Obama is constitutionally ineligible to be president, supports U.S. withdrawal from the United Nations, and harbors an unhealthy suspicion of Muslims. Earlier this year, he speculated that a tragic but accidental explosion at a Texas fertilizer plant might have been the work of Muslim saboteurs. Klayman also reads heavily into the meaning behind events in his own life. He has even gone so far as to suggest that agents of the Clinton administration may have tried to assassinate him. He is especially sensitive to matters of identity and identity politics. A Jewish-born convert to Christianity, Klayman sees anti-Semitism everywhere. He has described a judge who ruled against him as an anti-Semite, and railed against liberal Jews who, he contends, have betrayed the tenets of their faith. In a recent column for WorldNetDaily, he wrote that his heart “throb[s] in shame” over the crimes of the “felonious liberal Jews” who have committed “the moral equivalent of ethical and religious bankruptcy” by aligning themselves with the Obama administration. 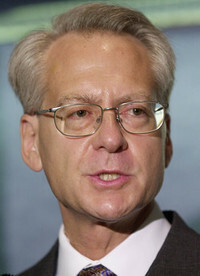 In 2004, Klayman competed as a candidate for U.S. Senate in Florida’s Republican primary, promising to shrink the government, push for America’s withdrawal from the United Nations, and demand “the immediate removal of Cuba dictator-in-chief Fidel Castro – by force if necessary.” In a fundraising letter to right-wing financier and former supporter Richard Mellon Scaife – who reportedly discouraged Klayman from running – he outlined plans to “investigate and prosecute in the Senate Hillary Clinton much like Richard Nixon did with the communist spy Alger Hiss,” and said he hoped to mount a challenge to Hillary Clinton’s seemingly inevitable presidential run in 2008. Despite endorsements from the likes of WorldNetDaily publisher Joseph Farah, who called Klayman a “hero,” Klayman lost the primary. His reputation was also dealt a blow by speculation, outlined in a 2004 article in the left-leaning Nation, that Klayman may have violated campaign finance law by soliciting a loan from the direct-mail outfit that assisted with his campaign. Though he returned to private practice and involved himself in the case of Terry Schiavo — a woman in a persistent vegetative state who became a cause célèbre for the Christian Right, which fought vigorously to prolong her life by artificial means — Klayman’s star appeared to be waning. In 2006, he sued Judicial Watch, alleging among other things that Tom Fitton, whom he had hired to replace him as president, had “hijack[ed]” the group and “defrauded” both Klayman and Judicial Watch donors. The suit backfired: Not only did he fail to regain control of the organization, but in 2009, a federal judge found that had violated his severance agreement by failing to reimburse Judicial Watch for personal expenses in the amount of $69,358.48. In 2011, the same judge sanctioned Klayman for “dilatory” and obstructionist actions that “needlessly delayed” his suit against Judicial Watch. Following his failed bid for the Senate, Klayman founded Freedom Watch as a sort of successor to Judicial Watch. Along with the predictable lawsuits against the Obama administration and a rather fanciful attempt to extract $10 trillion from Iran, he has in recent years represented a number of anti-Obama “birther” plaintiffs attempting to prove in court that the president is constitutionally ineligible for office, and sued major media organizations on behalf of politically like-minded clients who felt affronted by the attention they received. Lately, Klayman has begun to fall afoul of the law himself. The Florida bar publicly reprimanded him in 2011, and in June 2013, the Phoenix New Times reported that the Arizona State Bar was investigating him, possibly in connection with reports that he had misled the court about an administrative matter related to his appearance in a lawsuit against citizens attempting to recall Joe Arpaio, Maricopa County’s immigrant-hating, Obama-bashing sheriff. Also in 2013, the New Times published excerpts from an Ohio appellate court ruling that Klayman had “inappropriately touched” his own children. Yet even as his own probity and credentials were called into question, he continued his barrage of unwinnable suits. In 2011, he represented gay-hating celebrity preacher Bradlee Dean (whose “ministry,” You Can Run But You Cannot Hide International, is now a member of Klayman’s Regain America Now Coalition) in a $50 million defamation suit against Rachel Maddow and another reporter, which ended when a court ordered Dean to reimburse his opponents for nearly $25,000 in legal fees. The same year, naming himself as plaintiff, he sued Facebook and its founder, Mark Zuckerberg, for failing to act quickly enough on requests that he take down pages posted by Palestinian militants calling for the destruction of Israel and Jews worldwide. In 2012, a judge found the defendants were shielded from liability under the Communications Decency Act. Also in 2011, acting on behalf of publisher and friend Joseph Farah, who runs WorldNetDaily, Klayman sued Esquire magazine for more than $120 million over a satirical piece claiming that Farah had decided to destroy 200,000 copies of Jerome Corsi’s Where’s The Birth Certificate? The Case that Barack Obama is not Eligible to be President, which was about to go on sale when the president released his birth certificate. That suit was dismissed in June 2012. A lesser man, or one who felt in any way constrained by reality, might have been daunted by such setbacks – but not Larry Klayman. In 2012, he began convening “citizens grand juries” and calling for “peaceful” revolution. Maybe something big will happen. But more likely, as has often been the case with Klayman’s stunts, there’s just no there there.